KA is a rapidly growing scaly nodule that mimics Squamous Cell Carcinoma. keratoacanthoma (“KA”) is a benign tumour of the sebaceous gland that starts as a red or skin-colored spot and and grows rapidly over weeks. They usually grow to between 1 and 3cm in size by which time it usually has a central crusted plug. A Keratoacanthoma is a fairly common finding at a skin check although most people are aware they have a growth of some sort. Keratoacanthoma certainly has many similarities with SCC (Squamous Cell Carcinoma). It is often very difficult to tell apart both clinically and pathologically. 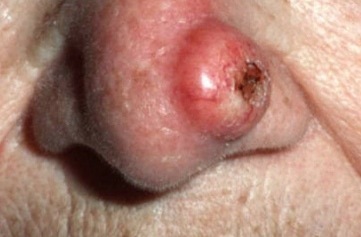 Keratoacanthoma may rarely itself develop into invasive SCC. Some experts believe that a KC is really a type of well differentiated (or “mild”) Squamous Cell Carcinoma. KA can occur at any age but is slightly commoner between the age of 50 and 59. There are rare reports of KA progressing to skin cancer. Pathologists say that it may be very challenging to differentiate a KA from SCC. KA may become large before they start to regress, and they do grow quickly. This period of growth will certainly cause alarm. It’s almost impossible to be clinically certain that a KA is not an SCC – the appearances are very similar even with a dermatoscope. How is a keratoacanthoma treated? 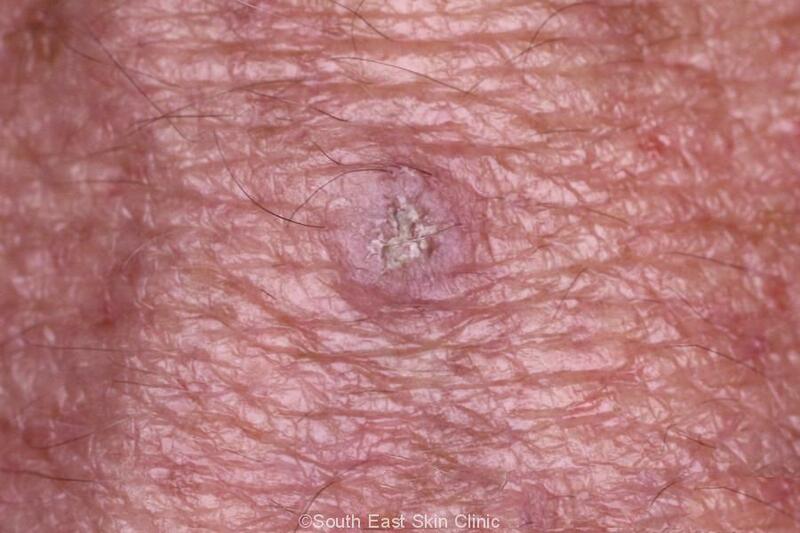 A Keratoacanthoma is usually removed as a formal excision which ensures that the lesion is removed in its entirety. A margin of at least 3mm is ideal. Importantly, the whole depth of the lesion is removed and this gives the pathologist the greatest chance of excluding SCC. Other treatment options may be considered (depending on the circumstance & discussion with the patient) such as curettage and cautery. However, curettage will need to performed deeply in order to ensure the whole depth of the lesion is treated. This wound may take many weeks to heal, another reason why formal excision is usually preferred. Medical treatments include injection of a chemotherapeutic agent. There are some of the key terms that may be found in the pathology report. A keratoacanthoma & Squamous Cell carcinoma may look similar – at first glance – to the pathologist. It is helpful for the pathology specimen to include the base of the lesion. 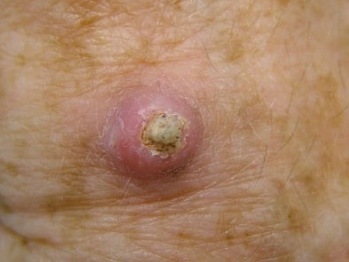 Keratoacanthoma typically has a central core like a Volcano. You can see this in the photos. This core consists mainly of keratin. The keratinocytes (the main skin cells normally found in the lowest layer of the epidermis) look fairly normal. They may contain “glassy eoesinophilic cytoplasm” – these are pale glassy coloured cells. There may be inflammatory cells underneath the KA. The different types of inflammatory cells found are lymphocytes, neutrophils &/or Eosinophils. In practical terms, KA is generally thought of as a diagnosis for the pathologist.